Click here for $15 tickets, or to make a donation! ONLINE TICKETS CLOSE 7pm, Friday Nov 24! After that, $20 at the door. 40 years of support to newcomers to Canada! Concert goers on Nov 24 will be blessed indeed, as you’ll have the opportunity to hear three “world premiere” Xmas carol performances, two composed by Stairwell Carollers’ director Pierre Massie, and one by OCISO’s own David Rain! 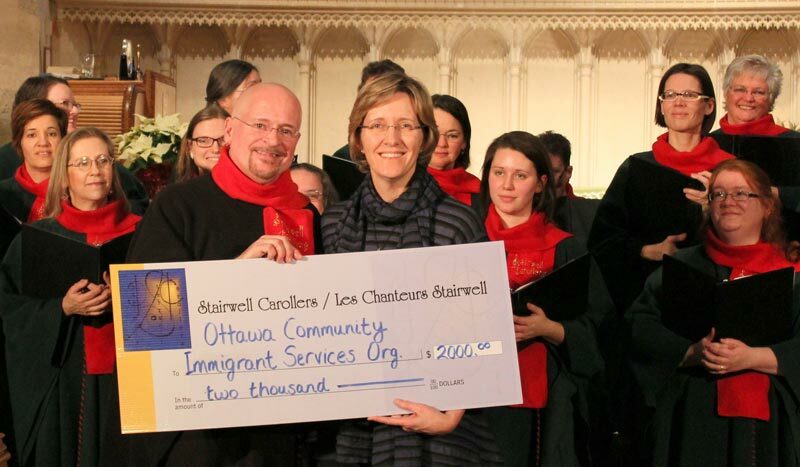 This is a benefit concert for OCISO, and it also celebrates the 40th anniversary of the Stairwell Carollers in 2017-18, as well as OCISO’s own 40th anniversary coming up in 2018. David Rain, drain@ociso.org, or Elizabeth Gluckstal, egluck@rogers.com. Proceeds to support OCISO’s programs for newcomers to Canada.